Your front doorway is a busy place. With visitors introducing themselves, your kids charging to and from the school bus, packages arriving, and hellos and goodbyes galore, it's hard for you to keep track of everyone who passes through. It's no wonder that doorbell cameras are now a smart home must-have, thanks to their ability to show you who's at the door, no matter where you are. And with an Alarm.com Doorbell Camera, that's just the start. Because these doorbell cameras are fully integrated into your smart home security system, they're powered by Alarm.com and able to cooperate with other devices. 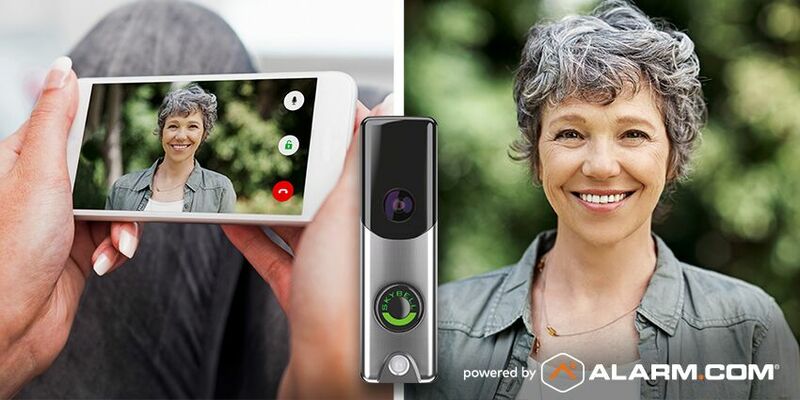 That gives you and your family more ways to incorporate your doorbell camera into your everyday life. 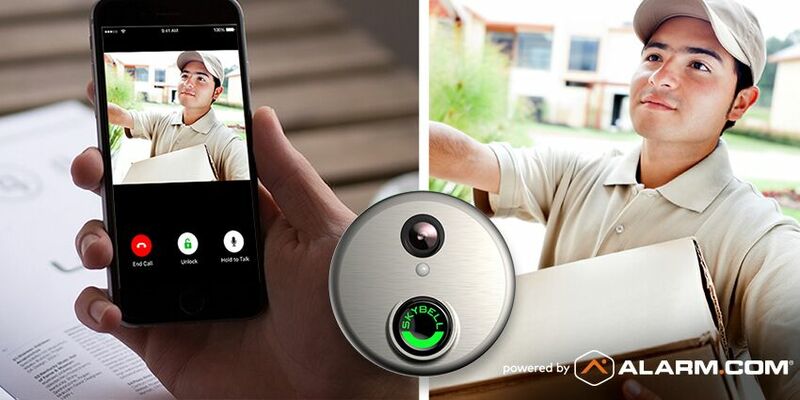 An Alarm.com-powered doorbell camera gives you a safe, smart way to see who's at the door, no matter where you are. When a visitor rings the doorbell, you get an Alarm.com smartphone alert. Open your Alarm.com app and you'll see a video feed of who's there, with a microphone icon that you can press to start a voice conversation through the doorbell. Although you can see your visitor, they can't see you, and you don't need to indicate whether you're home or not. Given that burglars often ring a home's doorbell as a precaution, this makes your video doorbell a great crime deterrent. 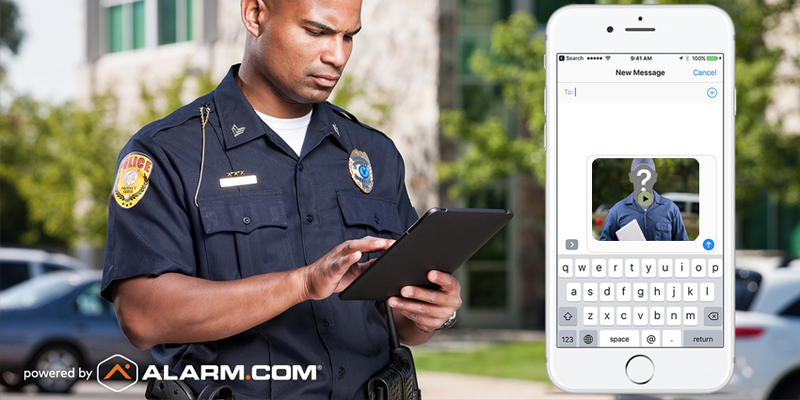 With a smart lock included in your Alarm.com-powered setup, you can go a step further and unlock your door remotely. This is great for protecting valuable deliveries that would otherwise be left on your porch. If you have a smart lock, you'll see an ‘unlock' icon in your app underneath your doorbell's video feed. Once you've verified the delivery person visually, tap once to unlock your door and ask them to leave the package inside. When they're done, use your app to lock your door and watch them leave. 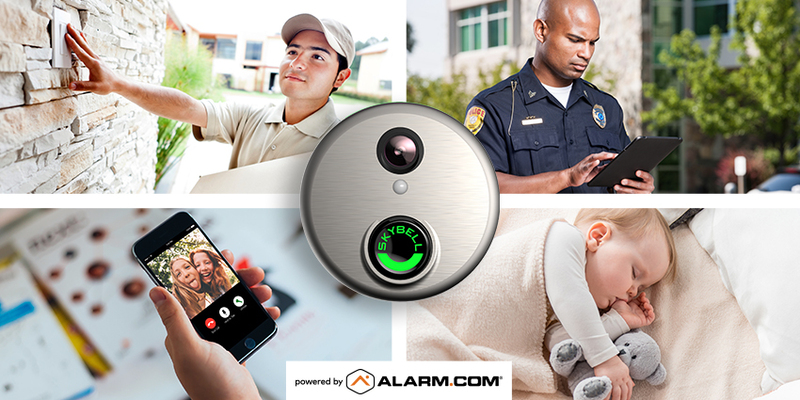 Alarm.com's video doorbell is also a full smart home security camera, ready to capture and send you footage of suspicious activity in your front yard or porch area. A visitor to your porch will trigger a motion-activated video recording, even if they don't press the doorbell. You can have these clips delivered to your phone right away, where they're easy to download and forward forward to your partner, neighbors or local police department. Crooks and intruders aside, most activity at your front door is ‘good' activity: friends visiting and family arriving home. Alarm.com makes it easy to keep up. 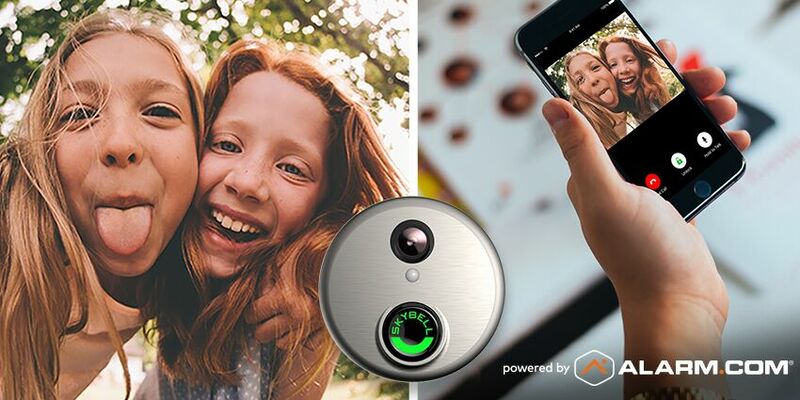 It's easy to create a custom doorbell camera alert, triggered by your kids' Alarm.com user codes, that sends you a video clip of your kids arriving home every day. It's a great way to make sure they're home safe and know who they're with. Once your kids know they're on camera, they might even give you a wave. PS: it's also a doorbell. Sometimes, you just need a doorbell. You'll be pleased to hear that Alarm.com's doorbell camera goes above and beyond, with both an audible chime and a special ‘Do Not Disturb' option that parents of young children will love. 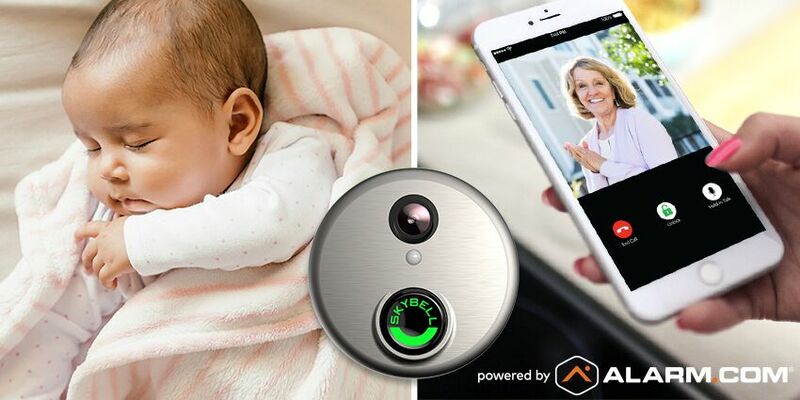 Instead of waking a napping youngster with an audible chime when pushed, your video doorbell will simply trigger a silent smartphone alert that only disturbs you. Want to upgrade your door with the Alarm.com Doorbell Camera? If you already have an Alarm.com-powered smart home security system, your service provider can quickly upgrade you with a doorbell camera or other smart devices, including indoor and outdoor video cameras, smart locks and even a smart thermostat. Don't have Alarm.com yet? Enter your ZIP code below to connect with a service provider today.